Packaging personnel should always wear gloves while handling metal parts. Parts should be clean and free of fingerprints before wrapping. Package your clean products as quickly as possible. The unprinted side of Daubert Cromwell paper should face the metal. The metal part should be no more than 12" from the VCI product. The closer to the metal, the better the corrosion protection. As a general rule, use 1 sq. ft. of VCI for every 1-3 sq. ft. of metal surface. Use at least 1 sq. ft. of VCI for every cubic foot of void space. Use Daubert Cromwell to separate metal from acidic packing materials such as corrugated boxes and wooden pallets in order to prevent corrosion at the contact points. 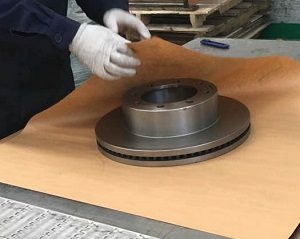 The duration of protection depends on the VCI paper and packing method used. Packages may be opened and resealed without affecting the corrosion protection. (Avoid touching metals during the inspection). Daubert Cromwell recommends inventorying no more than a six month supply of VCI papers or film. Store unused VCI in a cool, dry place, away from direct sunlight. Shade variations in the color of Daubert Cromwell papers are inherent and do not affect the length, quality or effectiveness of the corrosion protection. For best results, Daubert Cromwell recommends testing the VCI product for compatibility prior to use. Please click here to view new literature on our Guidelines.